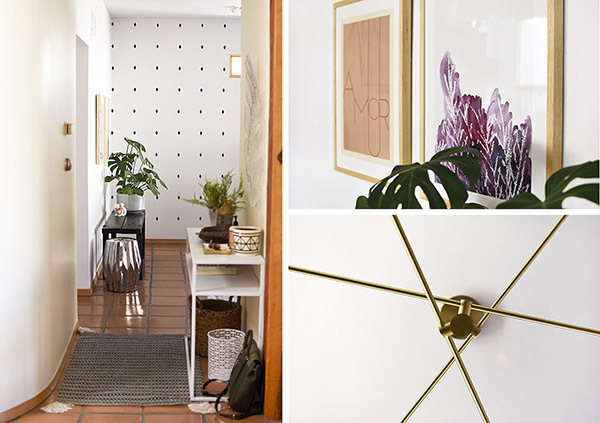 INSIDE : Give your home a fresh look with five simple updates. 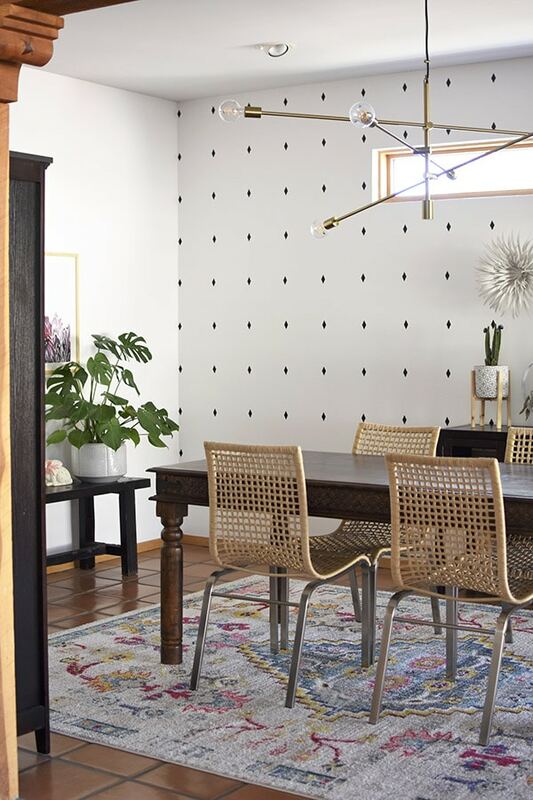 Check out how I turned my space from dull and boring to a Modern Southwest Dining Room with fun inexpensive ideas. THIS ROOM HAD A TWO PAGE FEATURE IN MARCH’S HGTV MAGAZINE! It’s official! The third room in our home has been updated (Living Room disco balls, Living Room new sofa + my Office) and I could not be more pleased with the outcome. We have been in this house for a little over a year now and I definitely feel like I should be further along with updating our space, but life. Also, full time blogger, mama to two littles, husband who still is working through his phd… again life. A few months ago, Modsy helped me reimagine the space and it was immensely helpful to start visualizing my new dining room. However I did not have the funds or want to buy all new everything. 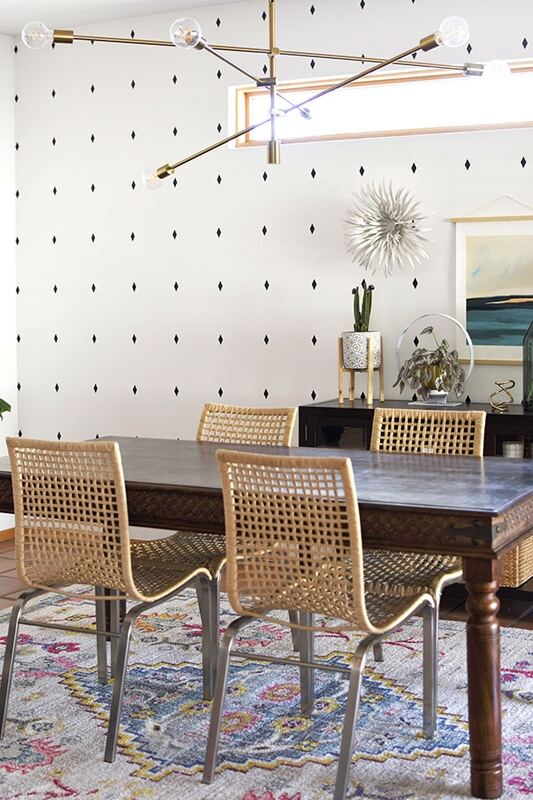 So today I am sharing how I gave my Dining Room a completely new look without starting completely over in five simple steps. It REALLY feels like a whole new space! Do I dare even share the old space? Okay, just one quick picture…. so much cream and tan and brown and terra cotta tile action. And maybe could I squeeze just a few more pieces of furniture in there???! 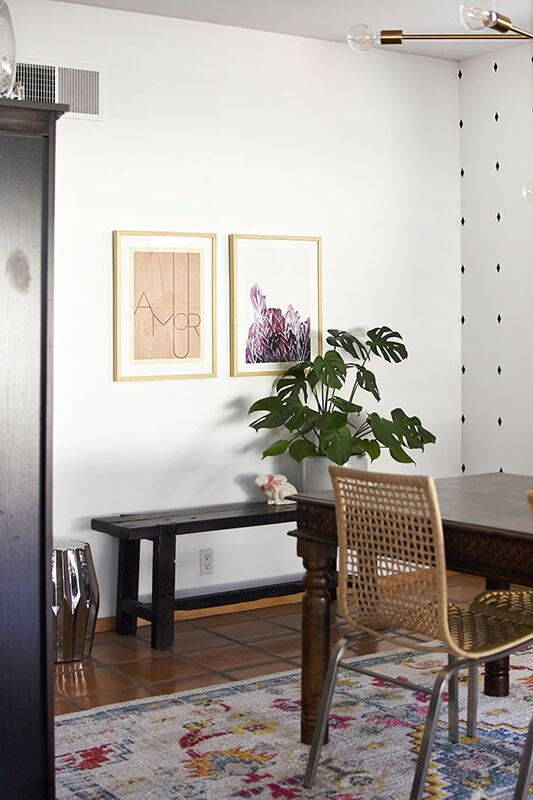 Using fresh paint can bring new life to a space. The very first order of business was paint. I really can not even begin to express to you all how vastly improved the dining room was after I simply painted it white. I mean, it was a night and day difference on immediately lightening and modernizing the space. I used my interior paint sprayer for the room. 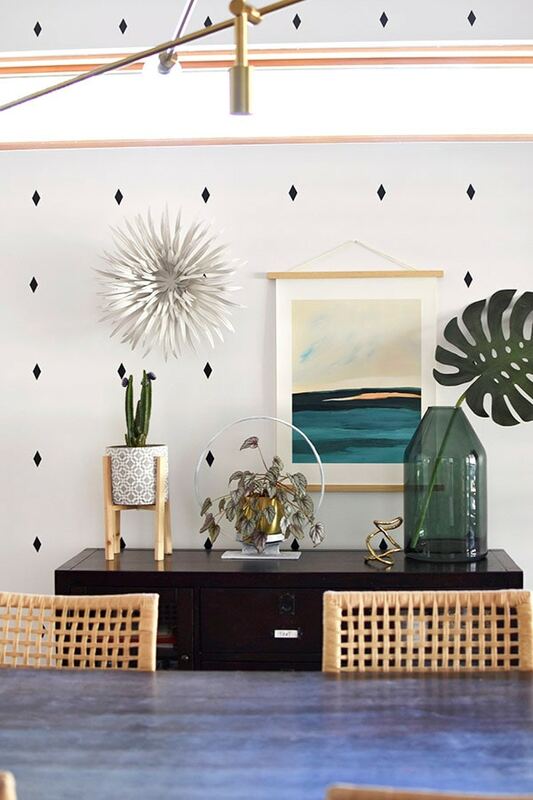 Add neutral pattern to your room with decals. I sat with the white walls for about a month. (I have really enjoyed slowly updating this room and making it a room I love. I took about four months from start to finish.) And while I loved the crisp clean white… I wanted to bring in more color and wow factor in the dining room. 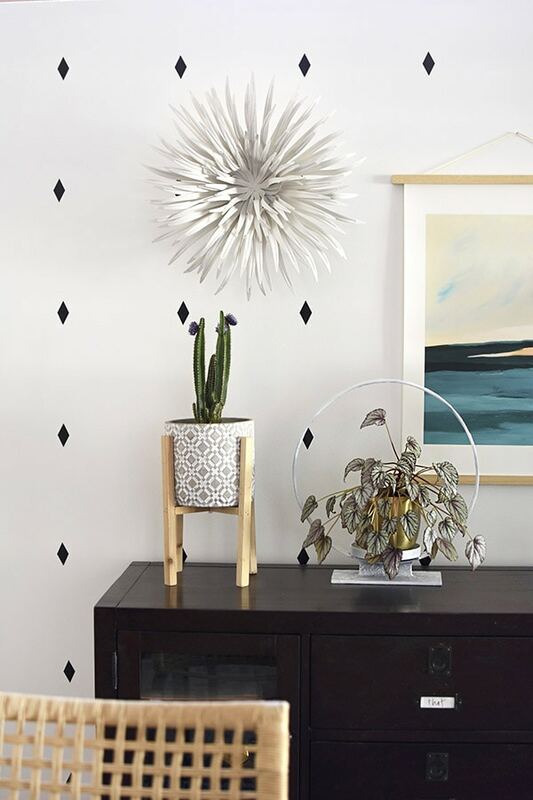 So, I came up with this very fun and extremely simple black diamond wall treatment. You can learn more about to create a wallpaper lookout without wallpaper here. Bring excitement into your room with a colorful rug. Another place that I decided to up the wow factor was with the rug. Now if you all were following on Instagram stories, it was back in MAY that I started playing with rug ideas. And I think I bought three in total before I found this one. Why are rugs so hard? Also, I didn’t want to spend a ton of money on a fancy rug because I still have elementary aged kiddos and guys news flash, they still make messes. I wanted some color but with our saltillo tile, I was really struggling to find the right combination of color, pattern and not clash with the tile colors too much. 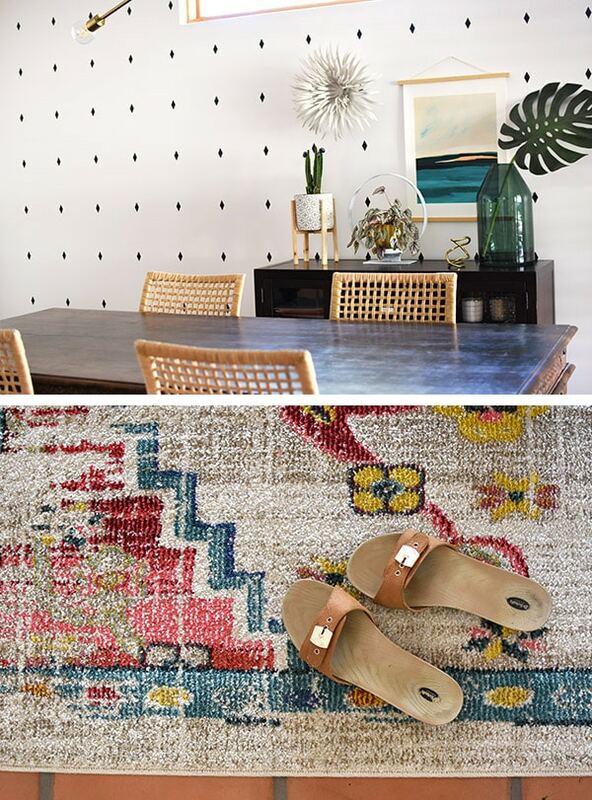 I loved that this rug’s pattern definitely nods to the Southwestern shapes and geometry. Being in a very SW home here in New Mexico, I liked being able to incorporate that style but in my own personal colors. 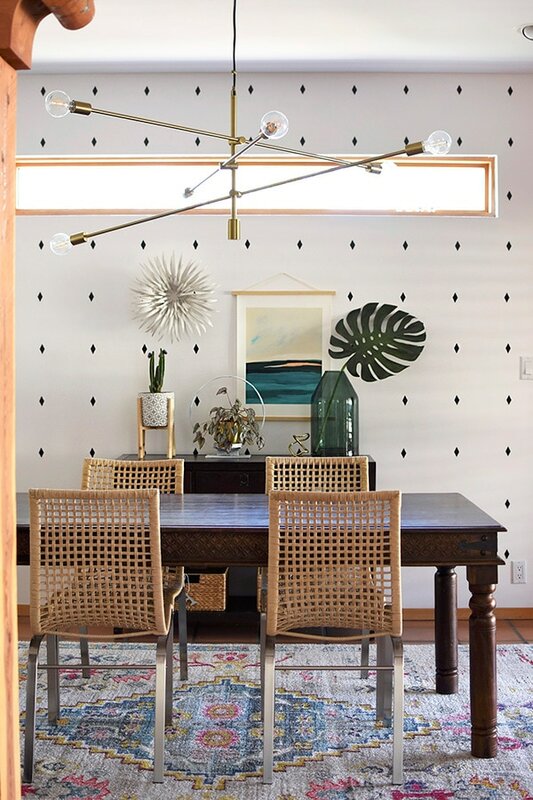 You can see the patterned dining room wall from multiple rooms in our home and I think it gives the room a perfect bit of excitement without being too busy. All the main furniture pieces we previously owned. Do I love them? I did 11 years ago when we got them… but I would be thrilled to get all new. However, I did some rearranging of furniture and I think they work much better now! 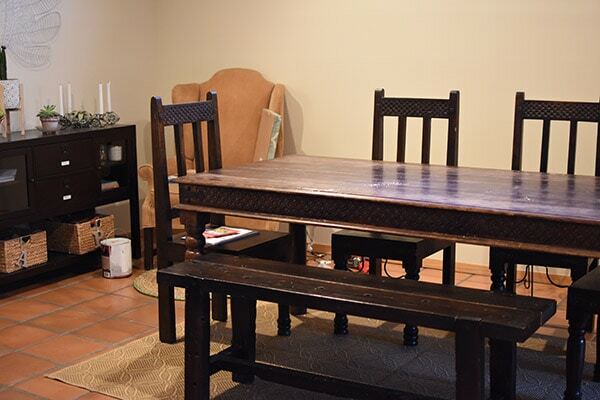 I swapped out our dining room chairs with our breakfast nook chairs that I found on Craigslist last summer for $75 (What a steal! If you can be patient and search those thrifty sales, it’s worth it!). Our old buffet table seems so impractical to me… for being such a big piece, it really doesn’t hold much at all. I am on the lookout for a thrifted inexpensive Mid-Century modern piece that can actually hold things. Give your room a wow moment with a gorgeous chandelier. Another show stopping moment is the chandelier. We were not originally planning on getting this new, but in an unfortunate turn of events, my husband somehow exploded the light fixture that was previously there and glass went flying everywhere. So, we had a gapping hole that needed filled. I am not sure if I could love a chandelier more. It is the Mobile Chandelier Grand in brass from West Elm. I waited and waited and waited and waited and that thing would not go on sale. I ended up using some old birthday West Elm gift cards and was able to get free shipping over a holiday weekend. By far, it was the most expensive portion of the room update, but I think it brings such drama to our dining room, so it was worth it in my opinion. Add in plants for an inexpensive way of immediately warming a space and bringing in tons of character. 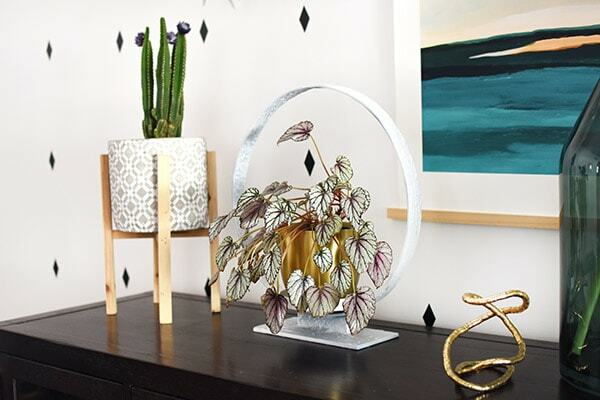 I had this circular candle stand for years, gave it a fresh coat of white paint and knew a plant would fit perfectly there! 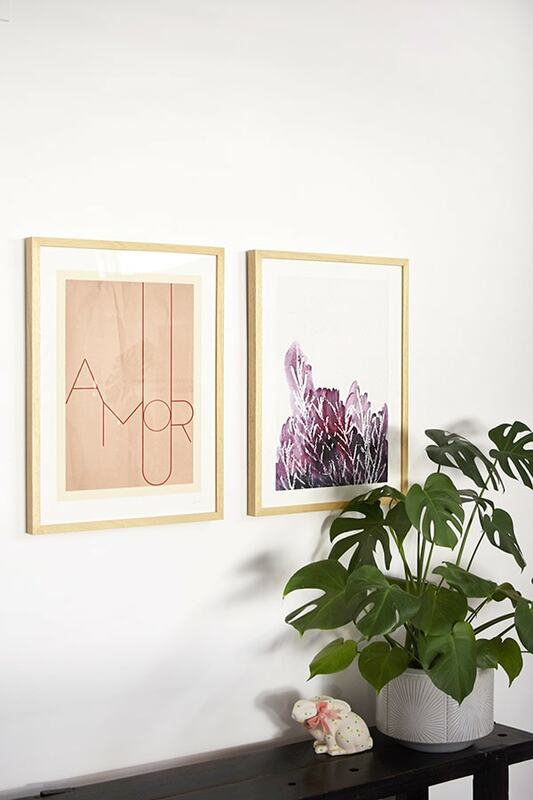 Bring in your personality to the space with colorful artwork. 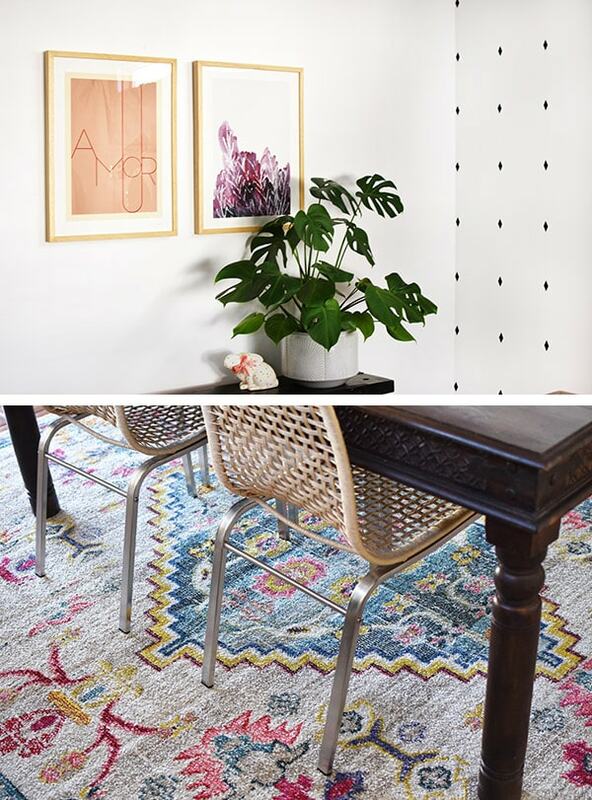 Colorful mix and match artwork from Minted really helped to tie in the colors of the rug and add bold interest to the room. Being able to see this little vignette each day, brings such a smile to my face. I still can’t believe I let it stay a dull brown space for so long. 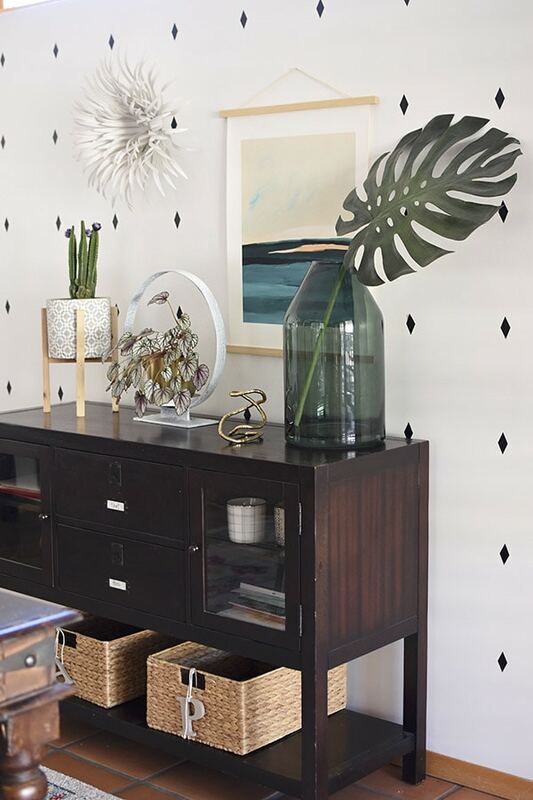 And I used this outdoor metal flower piece, but brought it inside for texture on the wall. It was such a fun find! I am so glad I took the time to slowly find inexpensive ways to make this space us, while saving up for the few bigger purchases. Our dining room now reflects us. It is bright, colorful and has a bit (or maybe a lot) of pattern! I thought the Modsy mock-up was perfection, but now I see this and I love it even more! My personal favorites include that show-stopping wall and the chandelier. I also have been looking for a deal on an MCM buffet/sideboard FOREVER but in our area people list MCM stuff at crazy prices, like $600-800…there are no deals to be hand in NJ, apparently. Happy hunting, I love this! Mode’s design WAS so good!! But I had to make it work without all new everything, ha. Thanks for the love, I’m pretty thrilled with how it turned out. It looks amazing!! I love the chandelier! It’s so fun and eclectic! Love the swap of chairs and that’s such a great idea when you don’t want to buy new furniture. That chandy is stunning! Pinning! Thank you so much, mama! Can’t wait for you to see it in person. It’s soooo good!!! I’m ga ga over the diamond wall treatment and the chandelier!!! Aw, thank you so much!! It’s amazing what a few small changes can make to a space. I have been patiently watching the process through your Instagram stories and as soon as you said it was live I stopped everything to come see the reveal! I could not love the end result more! 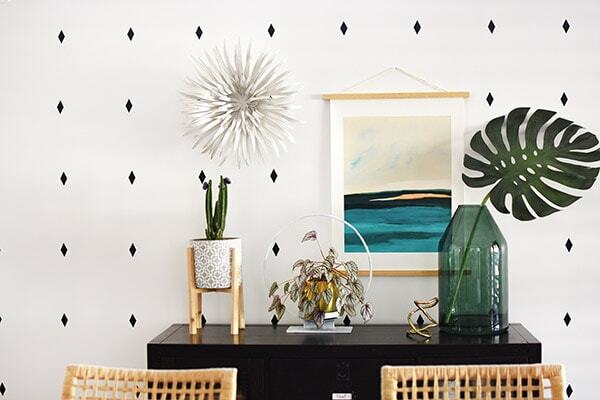 Can’t wait for the dining room wall tutorial, loving the diamond treatment! Gahhhhhh. I love this so much. If the process went any faster, you wouldn’t have come up with this epic end result!!! Well done. And those diamonds. Still swooning!